If you think Nokia is dead, think again. The Finnish tech firm has unveiled the N1, its first-ever tablet that runs on Android 5.0 "Lollipop." "We are pleased to bring the Nokia brand back into consumers' hands with the N1 Android tablet, and to help make sophisticated technologies simple," Nokia Technologies head of products Sebastian Nyström announced at the Slush technology conference in Helsinki. "The N1 has a delightfully intuitive interface and an industrial design to match it. This is a great product for Nokia fans and everyone who has not found the right Android tablet yet." The 7.9-inch tablet has an aluminum body and comes with an Intel 64-bit processor, 2GB of RAM, 32GB of internal storage, a 5-megapixel front-facing camera, 8-megapixel rear camera with auto focus, and stereo speakers. The complete specs are posted below. Weighing 318 grams, the N1 boasts a unique type of skin called the Z Launcher which automatically classifies apps and offer them to the user based on location, time, and routine. From the looks of it, social media apps such as Facebook mobile and Twitter are already built-in. 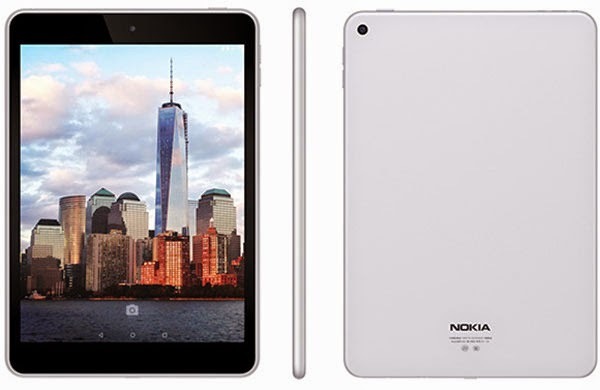 Nokia's premium Android tab is expected to be available in February 2015 for $250, reports said. It is estimated to cost between P15,000 to P18,000 in the Philippines.